Sure there are a lot of friends will ask, since the two kinds of tantalum capacitor spreads so big, and so the performance gap, can we see the graphics are on the small soybean (Japan's tantalum capacitor is generally small black beans), then how do we know eye gold? 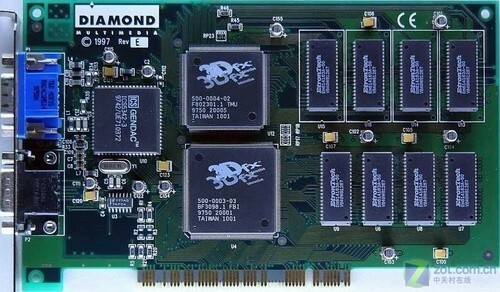 If the graphics card with a small bean, if he or tantalum polymer capacitor will only be AVX and KEMET products. The AVX product line in only one of the TCJ series is a tantalum polymer capacitor (see below), pay attention to electrical content have a little LOGO similar to the word "A", which represents the product of AVX company, and in 476 the numbers after a J word, on behalf of the TCJ series. It is said that if you find the word A in small soybean LOGO saw a big "J" then it is likely that polymer tantalum capacitor AVX. 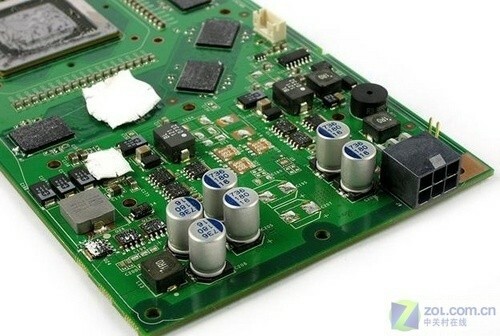 However, the performance of TCJ series is not very ideal, the price is very high, so it is rarely used in graphics cards, we focus on the KEMET another tantalum capacitor manufacturers on. 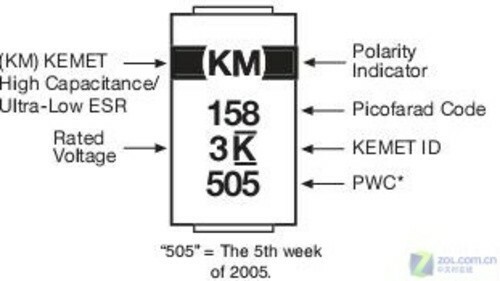 KO represents the polymer capacitor of KEMET products, the 157 represents the capacity of 150UF, representing 6 of rated voltage down is 6V, next to the long China like word "zone" is actually the K on behalf of KEMET, identification number. The following 512 represents the production date is the twelfth week of 2005. The most important of our consumers is "KO" two words, these two letters on behalf of you to buy complexes with poly tantalum capacitor. But if there is no "KO" represents what you buy is not the polymer tantalum capacitor do, the answer is negative, such as your super good luck, found that the tantalum polymer capacitor has the following pattern on the card if you have a KM capacitor above represents you to buy to more expensive KEMET multi anode polymer tantalum capacitor T530 series, this guy create the electrolytic capacitor ESR lowest ——4 ohm. Where M represents MULTI, Italy Si multianode. See, KEMET ultra low ESR tantalum capacitor T510 series of manganese dioxide much like polymer tantalum capacitor, but it is the only sign a letter with a plus sign, no two letter, we don't make the mistake of Feng Jing when the horse cool. All of the KEMET T520 series 2.5V and 16V two kinds of polymer tantalum capacitor card. Don't know what time can lead to the real history, the tantalum polymer capacitor really close to the general public, let the old king hall swallows, flying into the homes of ordinary people the future: the whole KEMET tantalum capacitor card. The above is from Taiwan, Pei polymer capacitor card brand 9600GT tantalum, type 9600GT, we can look at that guy a few large KEMET's son 16V 150UF product polymer tantalum capacitor, "KO" above two mark obviously.